At Catered Manor Nursing Center, we provide high quality skilled nursing and therapy care to ensure a superior level of rehabilitation for our guests. In addition to skilled nursing services 24-hours a day, we offer a team of rehabilitation specialists, offering physical therapy, speech and occupational therapy up to 7 days a week. Our rehab program is dedicated to getting our residents back to their highest level of functioning as quickly as possible. 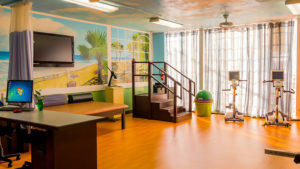 Catered Manor Nursing Center utilizes state-of-the-art modalities in conjunction with more traditional techniques in order to provide the highest quality rehab services available. We know choosing a health care and rehabilitation center for yourself or your loved one is one of the most important and difficult decisions you can make. You want someone who is caring, knowledgeable, and accessible. You want someone willing to take the time to go over all of your options. If you or a loved one are in need of health care, require advanced skilled nursing services and rehabilitation, then Catered Manor Nursing Center is the choice for you. Catered Manor Nursing Center believes in combining cutting edge technology with proven therapeutic programs to improve outcomes, decrease length of stay, and to get each of our guests to their highest practicable level of function and discharged to home whenever possible. We strive to provide our community with the highest quality of service with the most advanced equipment available. When you enter Catered Manor Nursing Center you enter a community of compassion. Our Homeward Bound programs restore individuals to their highest level of independent functioning by providing quality rehabilitation therapy equipment and services. We use most of the same equipment that is used on professional athletes. Catered Manor Nursing Center’s rehab unit offers their patients 2 private transitional care units. These apartment suites resemble their own living environment. Patients can test the strength and stamina of their newly regained skills. We have found it much safer for patients to discover problem areas before leaving us, rather than when they are home alone. Family members can also stay with the patient to test their readiness to provide help upon discharge. Contact us today to find out more about what Catered Manor Nursing Center can do for you! Catered Manor Nursing Center offers skilled short-term and long-term care, 24-hours a day, under the supervision of our Medical Directors or your attending physician. We provide comprehensive skilled nursing care using state-of-the-art medical equipment and progressive treatment plans promoting quality care. Getting residents back to their prior level of community function is of the highest priority to us following a hospital stay due to diagnosis such as stroke, broken hip, generalized weakness, urinary tract infections and heart attacks. We believe that choosing Catered Manor Nursing Center is a positive decision for you and your family.